after finishing the publix half marathon and full marathon a couple sundays ago, you can bet we runners were ravenous. we met up with everyone in the neighborhood of decatur at the pinewood tippling room, unexpectedly coming across the perfect restaurant review opportunity. known by the locals as the pinewood, this spot is a cozy neighborhood bar serving up “extraordinary cocktails and reinterpreted regional fare.” their space is clean without much fuss, and although they equally support what they call the high-class and “home-spun,” i felt a touch out of place in my running tights and sneakers. the other customers were dressed to the nines, it seemed, after maybe just having left church service with their family and friends. perhaps if i were coming on a different day i would have felt a little more comfortable. maybe that’s why they seated us way in the back…? nah, i don’t think so. i think it had more to do with the fact that we were a party of 12 and that was where they had room. i should have positioned myself on the other side of the table so that i could really take in the ambiance, for i was stuck facing a white-washed brick wall. oh well! good thing atmosphere is only one element of a restaurant, right? sure! 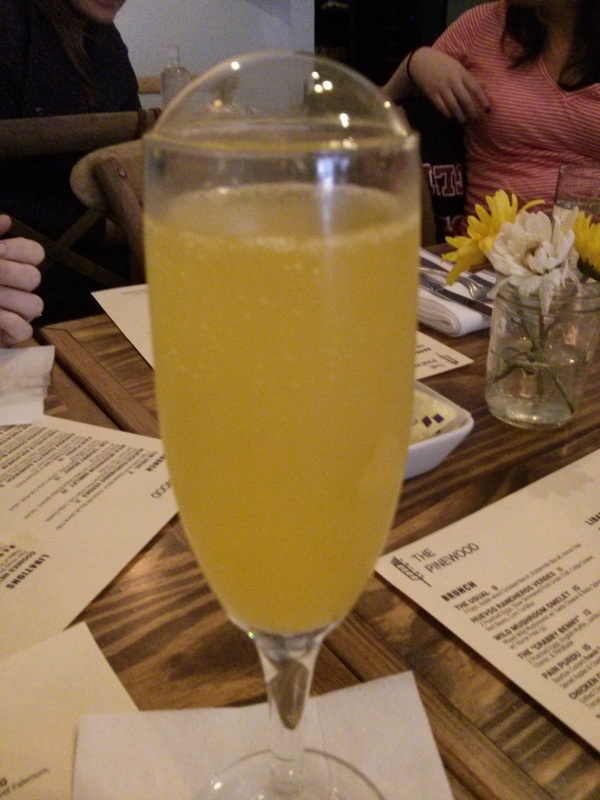 although i probably needed a couple gallons of water to rehydrate my body, i didn’t wait a moment to order a mimosa. something refreshing and crisp sounded like the perfect ticket, and these glasses were a great balance of orange juice and champagne. cheers! the pinewood closes at 2:30 p.m. on sundays, so we all had to somewhat hastily make our selections. with a decently sized brunch menu, though, i don’t think it was hard for many of us. 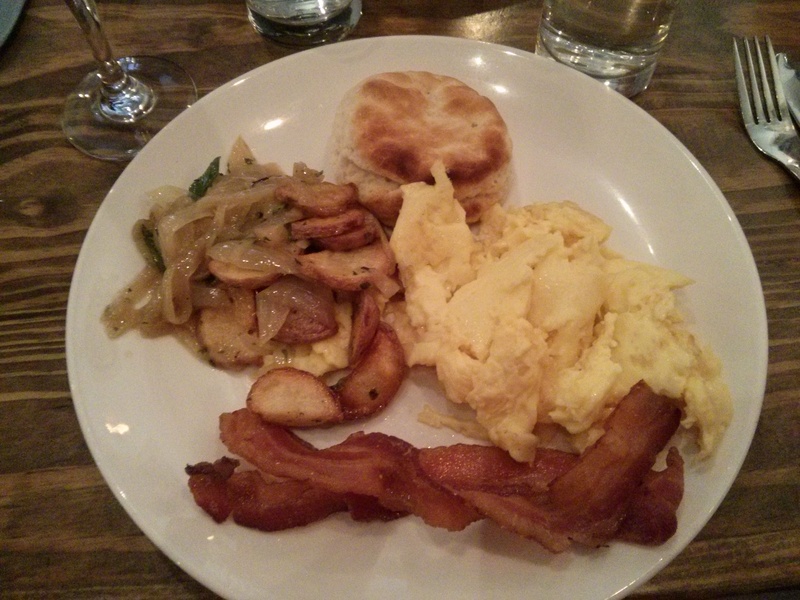 at the other end of the table, kari got things started with the usual, two eggs and applewood smoked bacon served alongside a buttermilk biscuit and home fries. kari typically orders this kind of dish whenever we go out for brunch, so i have no qualms in calling this her area of breakfast expertise. she said the plate was pretty standard for your standard breakfast. even though it may not have been anything truly extraordinary, it was just what she wanted it to be that afternoon. across from kari, kyle couldn’t resist trying the huevos rancheros verdes. 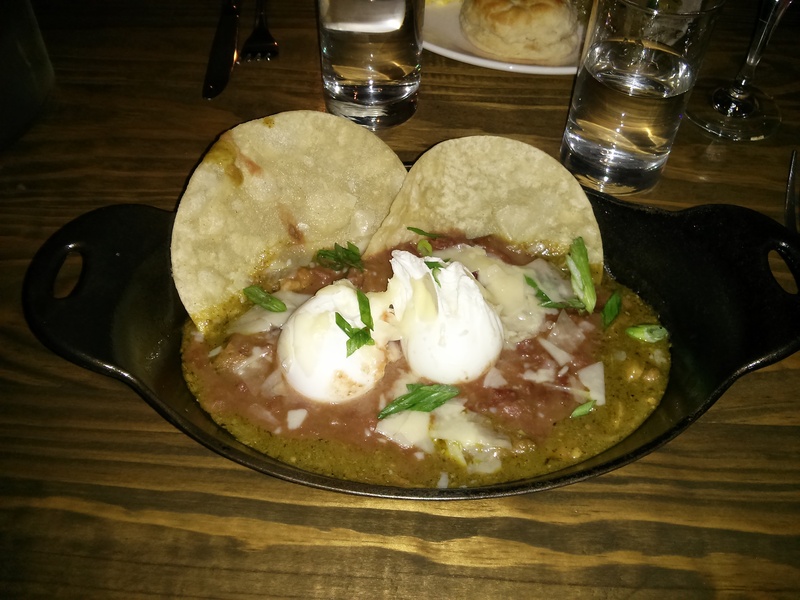 he’d never had this particular breakfast dish before, so i was even more excited to see how he felt about this little cast iron skillet full of slow simmered pork green chili, cotija cheese, red beans, poached eggs, and corn tortillas. even though these aren’t his words, i give the pinewood a solid 8 out of 10 for the presentation. how could you not want to eat something when it looks like that? honestly? now, with that being said, even though those tortillas are so cute tucked in with the rest of the ingredients, kyle wishes they had actually been served on the side because the bottoms were a bit soggy from all that sauce. even though i didn’t have a bite, i can agree with it. the shredded pork wasn’t too shredded, something kyle greatly appreciated because he was really able to get the flavor of the meat with the green chili. i was a touch jealous of his meal, and if i find myself back at the pinewood for brunch, there’s a good chance i’ll be ordering this dish. marathon man bank needed something a bit more substantial than eggs that afternoon, so the pinewood cheeseburger seemed like a good choice. nathan had raved about this dish from the moment we stepped into the restaurant, and it’s hard to blame him when you see that it’s a double-stack fully dressed with remoulade and bacon and then tater tots on the side. with a burger this size, it’s no surprise that bank was only able to eat half of it, which is saying something considering he’d just been running for over five hours straight. definitely a two-meal meal. okay, i’m sorry. maybe that was a little silly and out of left field, but come on. you have to give me points for creativity or originality or something! okay, maybe just points for weirdness. yep, i’m probably pretty deserving it that category most of all. moving on! to my right, phillip went a little adventurous with the crabby “benny,” a interesting creation of asparagus confetti (who knew such a thing existed? 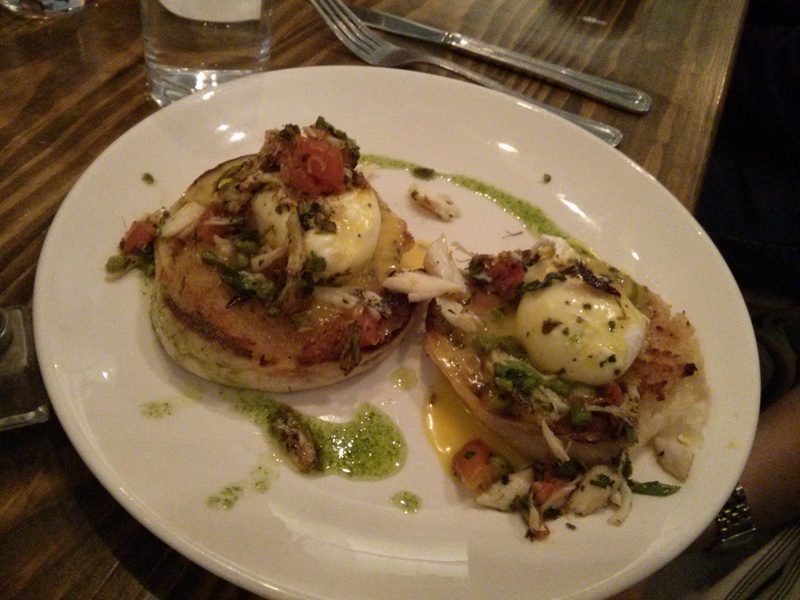 ), crab meat, poached eggs, sauce choron (a variation on the classic bearnaise), and persillade (a mixutre of parsley and garlic) atop the classic english muffin. when his plate was placed in front of him, i think we all were a little confused and intrigued, if one can be both at the same time. we looked over and under and around the english muffin but nowhere did we see the crab. ah, but wait. it wasn’t a crab cake like we were expecting (although we shouldn’t have expected that because that’s not even how it was described on the menu); it was lumps of crab meat kind of sprinkled here and there. upon further inspection and tasting, phillip concluded the amount of crab in the dish was a little disappointing. perhaps we read what we wanted to read and were a little let down? who knows. regardless, the rest of the ingredients tried hopelessly to raise this dish up to a level that seems is quite out of its reach. adorning the unimpressive lumps of crab was the green sauce (aka, asparagus confetti), which was quite an overkill to the rest of the flavors, especially the savory choron. despite the fact that the largest components of the dish were underwhelming, phillip did enjoy the poached eggs, chives, and english muffin. although the eggs could have been a bit runnier, he liked them plenty. (sidenote: phillip and i have an obsession with runny eggs. basically we think all eggs should be runny, even if they’re hard-boiled or scrambled. okay, it’s not that ridiculous, but we when we say we like runny eggs, we mean it!). last but not least, liz and i both went for the chicken cordon bly!, a slight twist on the popular sandwich. here we had a savory cheddar & herb waffle with crispy chicken, sliced ham, and swiss cheese inside. on the side was a ramekin of crystal chicken gravy, and also on the plate was a scoopful of home fries. i am going to warn you now that i was quite a critic with this dish, and i think it took liz a little bit by surprise. we’ll start first with the home fries. they looked savory with all those herbs and seasonings on top, but i felt they were quite flavorless and a little undercooked. on the other hand, liz loved them and especially liked that sauteed onions were thrown in the mix. i gladly would have given her all of mine, no questions asked. so now let’s talk about this chicken and waffle setup. first, i just loved the presentation. i was expecting a smaller portion, and that’s exactly what was here. i would much rather have had two sets of chicken and waffle, swapping one of them out for the potatoes. maybe they can do that upon request…? maybe, just maybe. anyway. the chicken and waffles were divine. the melty swiss cheese was an unexpected component that paired incredibly with the crispy, panko-coated chicken and savory ham. the waffle was full of flavor and wasn’t dry at all. i seriously could have eaten it five times over and still wanted more. what i didn’t want more of, though, was that gravy. i tried one bite of the waffle with it and didn’t want another one. i can’t even remember the specifics of its taste, but i was expecting and wanting a white peppermill gravy like you get with biscuits and gravy, and that is not what this gravy was. stay far away from it! as we stuck around until closing time, we relaxed our full bellies in the company of our good friends. too soon the music selection (which was actually very great; so great, in fact, that both kari and liz commented on it) carried us out into the drizzly and cool afternoon. it had been an early morning and long afternoon, but it’s for moments like these that i wouldn’t trade a thing. Must. Have. Chicken. Cordon. Bly. you can have it when you’re in town next weekend! !